Preview: Washington State took a step back going 3-9 overall last season after reaching a bowl game the year prior. The Cougars only had 2 FBS wins in 2014 and they came against Utah and Oregon State on the road. 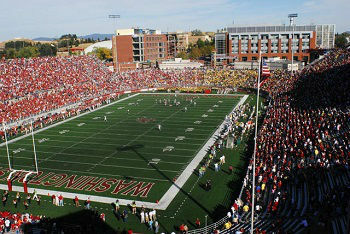 The home crowd only witnesses a home win against Portland State last season and the fan base is hoping the team can rebound coming into 2015. Through his 3 years as the head man Mike Leach has effectively implemented his pass heavy offense, but the team has had limited success going 12-25 overall. Washington State had their starting QB Connor Halliday go down to injury midway through last season and that opened up valuable playing time for redshirt freshman QB Luke Falk. Expect Falk to continue on with his progression after showing strong play and potential in his time as the starter in 2014. With all 5 starting O-linemen back look for the Cougars to run the ball a lot more this season and expect Falk to even take some snaps from under center. The RB position is set with returning cogs Jamal Morrow and Gerard Wicks back in the fold. The WR position loses some great playmakers, but the cupboards are far from empty building around Marks and Williams. After going through a disappointing 2014 campaign Washington State decided to go in a different direction on defense bring in new DC Alex Grinch from Missouri. Grinch puts a premium on speed and it’ll be interesting to see how he transitions from being a safeties coach to being a DC. The spot on defense that faces the most turnover is the D-line with just 1 returning starter. Some key pieces need to be replaced and Washington State has a lot of question marks surrounding the tackle positions. The Cougars return 3 starters at the LB position and this unit will be led by guys like Pelluer and Allison. The Cougars have a lot of option to find fits with in the secondary. Look for Washington State to inject some new blood into the unit building around 3 returning starters. Prediction: Washington State disappointed in 2014 as the team was supposed to build off of their surprise bowl game appearance from 2013. The Cougars have been at or near the basement of the Pac 12 standings consistently over the past decade and this team is looking to get better results under the Leach regime. Leach will be entering his 4th year as the head man and it’s now or never for the team to start taking steps forward. The Cougars are betting on some infusion of JUCO players to boost the squad in 2015.